Have you ever seen happier kids on the first day of school? The mom is pretty darn happy too. And the dad who acted as photographer this morning. I had a little extra time this summer - OK, LOTS of extra down time in bed waiting for my foot to heal. So what did I do? I learned to embroider. 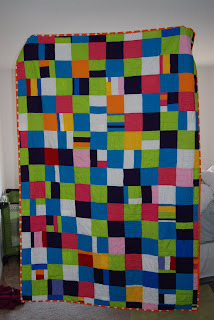 I actually finished this quilt a few months ago but I was lazy, um, no I was just waiting for the right time to post it. 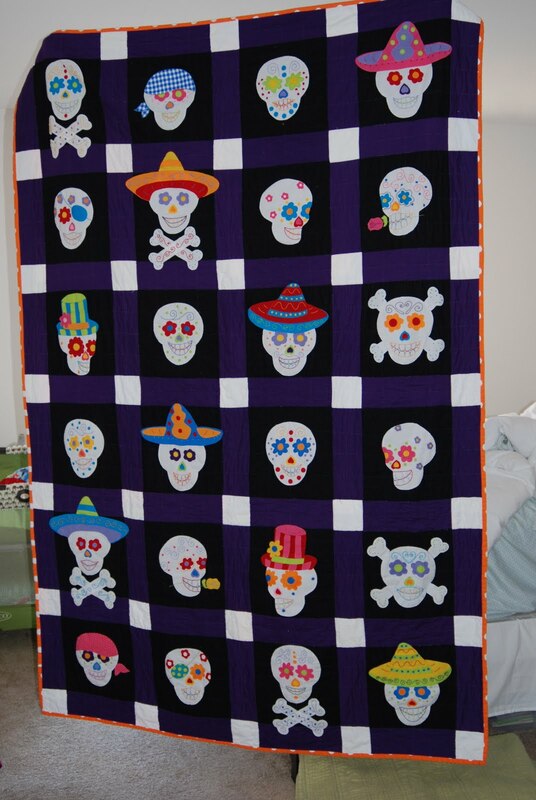 So, by popular demand (by one friend - but hey, she's popular), here's the skeleton quilt! This is the first time I've ever made up my own pattern. The blocks were easy, but the skeleton faces were not. I based them on a pair of pajama pants I got at Target a few years ago. Really! See if you can find them in this post. I ironed on the white skulls first and then all other fabrics before I got busy embroidering. The ironing is not permanent - sad - so everything had to be stitched on. Sure I could have used the sewing machine but apparently I was feeling up for a challenge. It took a long, long time, but hey, I had plenty of that. My mom taught me a few stitches when I was a kid but I didn't really remember them so I found some good tutorials online, none of which I can remember right now. If you want them, let me know. I can search again. And here's a lovely close up of some of my favorites. I gave all the skeletons names, by the way. Can you guess which one I called Bret Michaels? And because I still had more healing time I did a crazy back. I love this one too. Isn't there a book about an elephant that looks something like this? 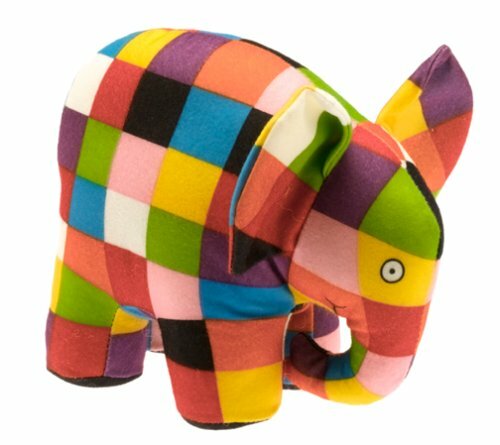 I just googled "patchwork elephant" and look what I found. Who knew I took inspiration from colorful jungle animals as well as pajamas? Finally, here's the binding. This might be one of my favorite parts of the quilt. A good orange polka dot might be my new signature fabric. 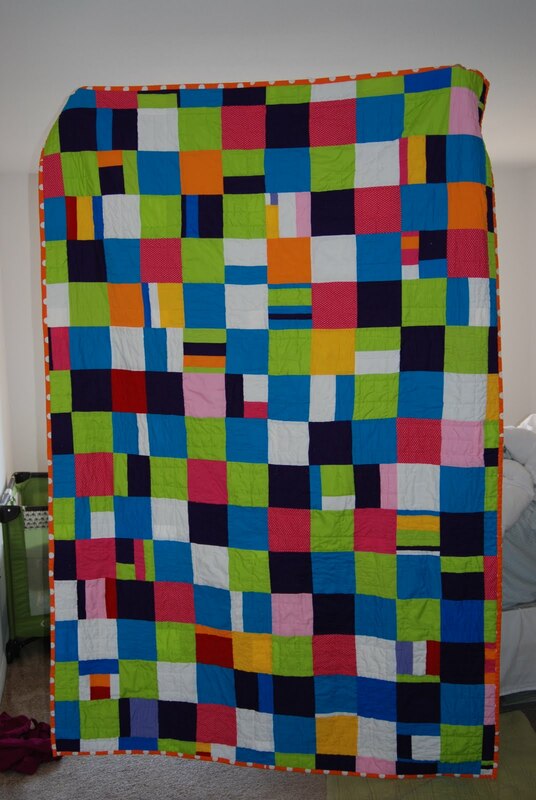 So that's the quilt. I hope you enjoyed it. I'd love to make you one but then I've have to break my foot again and considering the fact that it's still not all the way healed from the first break I'll have to pass. And now it's the first day of school for the big sisters! Happy 3rd grade to Emily and happy 1st to Molly. I think Molly made it out the door without eating breakfast and I know I didn't remind them to pack their snacks. Oh well. It's a learning process for the mom too. Now I'm all alone. I think I'll take a nap. That's right - school plural. Today Heidi went to two different schools! She started the day at Ms. Cathy's school and was so happy to see her preschool friends again. After we picked her up we took her to Ms. Ronnie's school for some more fun. I swear, you have never seen a kid more excited for the first day of school. It was like Christmas over here! I hope she's still as excited when she comes home in a few hours. I had big plans for the summer. Not everything worked out just how I'd hoped so when the whole group got to sneak away for the week we had to jam all the fun in at once. Oh, it was fun, that's for sure! Heidi has to take her job as the driver more seriously if she wants to medal. I hope Molly has been working on her quad strength. We found an art festival with face painters. Emily was not in the mood for butterfly eyes so Scott took her place. Oh la la. The girls' favorite part of the week was the dance camp. My cousin has a dance studio and the girls have participated for the last two years. There wasn't even a thought that we wouldn't go back because - and I am not kidding - the girls asked if it was time to sign up at least two times a week for an entire year. We went catch-and-release fishing in my aunt and uncle's backyard pond. This was a BIG hit. None of the girls had been fishing before and since the pond was stocked they each caught something within 30 seconds. Here's Heidi "gently patting" her fish just the way I asked her to. When it was time to release, Molly wasn't even grossed out! She just scooped up the fish and tossed it back in the pond. Emily's Mega-Koi was a little trickier to pick up. We hope this one is still alive after the very exciting toss back into its home that Emily gave it. We also hit the Hogle Zoo. There's a lot of construction going on right now so they brought in dinosaurs to keep the visitors entertained. As you can see, we were completely entertained. On the last day we took the Snowbird tram to the top of the mountains. The ville is a pretty nice place, but I could handle having this scenery around me every day. A wise woman once told me the reason she sleeps with a water bottle is so she can rehydrate all night long. "Otherwise," she said, "you're just playing catch-up all day long." This would just make me need to use the bathroom all night long, but whatever. Also, I think it's hilarious and every time I think that I need to catch up on something I always think of that story and giggle. Anyway, here's three months worth of fun in one spectacular post! Last time we left off I was in the ER. It turns out I chipped bones, messed up my joints and my ligaments. NEVER jump off a 6-foot fence onto concrete while wearing Converse. I think part of my problem was that I'd just listened to a really interesting podcast about Parkour and thought I could do it. Sure, I landed like a cat . . . a cat with osteoporosis. And here's what happened immediately after I hurt my foot - Molly's birthday party! Gees, I couldn't very well skip the party and go to the ER. Molly, please forgive me for putting your cake on a cutting board and not making it very fancy. I was kind of in pain. I don't think the kids really cared. They had fun and that's the goal, right? 10 days later is was Scott's birthday! We celebrated with breakfast foods and an ice cream cake on Justin Bieber plates. That was Heidi's choice. He didn't want to let on, but I could really tell that Scott was excited about those plates. A few days later Molly was "Big Bertha Lee" in her Kindergarten play. BBL is supposed to be the loud boss of the goat group. Good casting, Mrs. DiBlasio. Then it was time for a makeover. Here's the before photo. Say adios to the hair which was actually long enough to donate. Say goodbye to the un-pierced ears too. Ooh, it was an exciting day. Ta-dah! Here's the after photo. Looking good, Emily. Oh, and happy birthday to you! Next Heidi graduated from preschool. Since it was only the first year she has another year to go before Kindergarten. She has decided it's time to start Kindergarten anyway. School starts for her in 18 days (yes, I'm counting) so I guess she'll figure it out soon enough. Being 8 means baptism in our family. Congratulations Emily! Ah yes, by now I'd had my first of two foot surgeries. That's right, I signed my own cast - anesthesia makes me a little loopy and I didn't want to forget my name. We've been trying to have an exciting summer around here. Things just take a little (OK, a lot) longer. All the girls did well in swimming lessons this summer! Molly discovered that goggles make swimming fun. Emily discovered that she's a great swimmer and Heidi discovered that I wasn't kidding when I said that the teacher would help her go underwater and it wouldn't be scary. Whew! Great job, girls! Suddenly it was time for dance recitals again. Heidi loved, loved her costume and if it hadn't been itchy she would still be wearing it. Scott calls this the Toddlers and Tiaras photo. I'm a little freaked out by this one. I swear she's only 8. I guess it's good to be tall. I looked like I was 8 until I was 15. Tomorrow is my next foot surgery, so we've been packing in the fun. Yesterday we went to our favorite cupcake bakery. The girls all picked the root beer float cupcake. It looked cute but was kind of gross. Oh well. By the way, yes, Molly is wearing a dance costume to the bakery and yes, she was wearing a swimsuit at her birthday party. Fashion is her passion. This is the last time I say all I want to do for Mother's Day is lie in bed and relax all day. Luckily Emily saved the day for Flat Jenny who still wanted to race this morning.